Do you want to learn about and take full advantage of your Bernina sewing machine’s capabilities? While making the Spring in Prague quilt you will explore many functions of your machine, including decorative stitches, use of embroidery unit. Many Bernina feet and accessories will be highlighted. 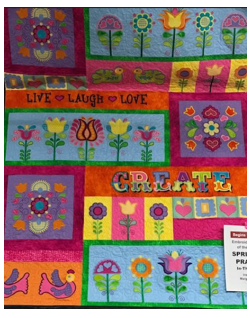 This 10 month Block of the Month is designed for the Bernina 3 series and up. $35.00 for the first month and $15.00 for each successive month.